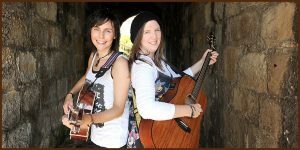 Fast becoming Court House favourites, MixTape are back for another great evening of laid-back acoustic sounds. Join us and them for drinks, tasty eats and some great live music. They're back! We are delighted to welcome the fantastic Coaltown Daisies back to the Court House Kinross. With their unique brand of folksy Americana, and our great food and drinks, it's sure to be a night to remember. Booking is recommended. Call us on 01577 351020. Treat Dad this Father's Day! 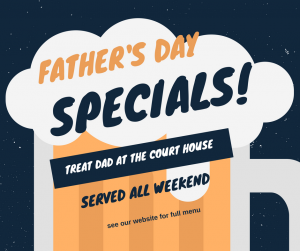 Our weekend specials menu has been created with Dad in mind and features such treats as Haggis and black pudding bon bons and a delcious Pork and chorizo burger. We'll also be offering a pizza/burger and drink deal on the big day so bring the big man down! Our festive menu is available from 1st December and features a delicious range of fresh, tasty, seasonal dishes. Tables book up fast so please make your reservation soon! We are unfortunately unable to provide split bills. However, we are more than happy to take separate payments. Please let your server know the amount you are due to pay from the total bill. 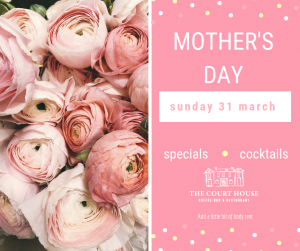 Join us at The Court House Coffee Bar & Restaurant this Mother's Day. Open from 9am for breakfast, home baking and excellent coffee. We'll be serving specials from lunchtime sure to show Mum just how much you appreciate her. There might be the odd cocktail or two as well! Bookings now being taken.